It’s not unusual for a new high-performance street-legal car to have its tires specially designed to handle and augment its capabilities. The . In its case, Pirelli developed a new 20-inch P Zero tire featuring Formula 1-derived technology. Here’s how it works: Pirelli engineers modified the tire’s tread pattern to as well as to provide plenty of extra grip, and then further adapted the P Zero’s performance to match the sedan’s driving characteristics. What’s particularly interesting is that the tire compound contains special polymers Pirelli developed for Formula 1. There’s plenty of grip even in wet road conditions and the tires also ensure the M5’s front and rear axles are ideally balanced. Pirelli engineers claims they used different layered constructions in the front and rear tire carcasses. The P Zero tire contours were also matched to the wheel rim, which makes sense given Pirelli’s perfect-fit philosophy. 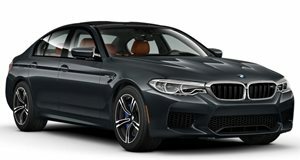 Developing these tires also posed some new challenges due to the fact the new M5, for the first time, features standard all-wheel drive, though there’s a rear bias. And as the case with any M division vehicle, owners want their cars to make serious noise, so some necessary tire screeching is required. Pirelli ensures these new P Zero ultra-high performance tires will make that happen.